Power-saving transmission technologies have been, and will continue to be, the key to expanding the capabilities of mobile radio. This is particularly true of transmission technologies that make use of time division multiplexing, for example GSM or TDMA, and also applies to the “slotted mode” used for CDMA – in both cases power supplies have to meet special requirements. R&S®NGMO can meet voltage drops without any hint of output voltage instability. The R&S®NGMO can be used to emulate this critical case as its output impedance is adjustable. This also means that different types of batteries (NiCd, NiMH, Li-ion, Li-polymer etc) can be emulated to a certain extent. This ensures that nothing can happen to invalidate tests despite the general trend to lower supply voltages. Conclusions can be drawn about whether or not the subassemblies to be tested are functioning properly by forming the differences of the measured current drain of a sequence of signals occurring in rapid succession. It goes without saying that long-term monitoring (current drain) can also be performed on DUTs by choosing sampling intervals of the appropriate length so that the effect of other operating parameters on current drain can be investigated. However, power consumption is also becoming more and more critical for subassemblies which are not batteryoperated. Operating modes such as idle, sleep or power down are being encountered more frequently in electronic equipment because higher clock frequencies coupled with an increasing level of integration are making it impossible to ignore efficient energy management. The R&S®NGMO2-K10 operating software for the R&S®Current Sniffer is a user-friendly tool for performing longterm analyses of energy consumption, short-term current/voltage analyses with high time resolution or simple battery tests on DUTs. The recorded trace files can be ported to other programs or analyzed again in a postprocessing run with high time resolution. There are extremely wide variations in the current taken by mobile telephone operating modes. It is essential to have enough resolution to detect deviations from the normal mobile mode whenever they might occur. 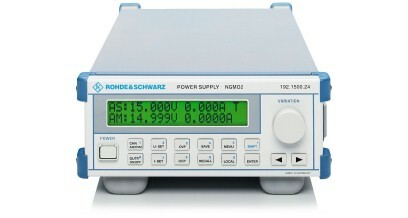 The R&S®NGMO, therefore, has different current measurement ranges for both static and dynamic current measurements. The R&S®NGMO also has the necessary voltage setting resolution to calibrate and adjust DUTs and to provide reproducible voltage levels. The R&S®NGMO2 has two completely identical supply and measurement channels. This means that this small power supply unit can be used to form the basis of an independent parameter test setup for semiconductor components. The R&S®NGMO2 can also handle up to four relays and respond to remote control commands. As each channel has an inhibit input, if required, a pulsed supply voltage can be fed to the components to prevent overheating during tests or to simulate a standard pulsed operating mode (e.g. TDMA power amplifier).